On getting to the spot, Salami tried to arrest the gang for breaching public peace but later got pummeled, which resulted to severe injuries on him as some of the suspects beat him and poured drinks on him. 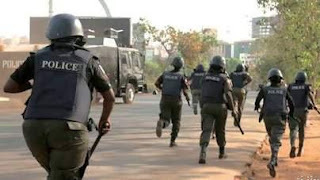 Edward Salami, a Police Sergeant attached to Ejigbo Division in Lagos State, has been taken to the hospital after he received serious beating from six suspects he had attempted to arrest at a joint in the community. It was gathered that the gang were having drinks at a joint at Pipeline Junction, Ejigbo when the victim was invited to perform his official duty. Salami went back to the station where some of his colleagues mobilized themselves and made their way to the joint. The officers arrested one of them while others forced their escape. The caught suspect, Abeeb Ola, was arraigned before the Ejigbo Magistrate Court for assault.He pleaded not guilty. The prosecutor, Supol Kenneth Asibor, informed the court that the victim, a police sergeant, was performing his lawful duty before he was attacked by the suspects. The Presiding Magistrate, Teslimi Shomade, granted Ola bail in the sum of N50,000 with one surety in like sum. He was remanded in prison custody pending when he would be able to perfect his bail condition. The matter was adjourned till January 9, 2019.